My interview with Kevin B. Lee, video essayist, was announced on Twitter but will actually go up next week, in three parts. Well, I'm sure you've heard the news. Twin Peaks is now without David Lynch. According to the auteur, Showtime will not give him what he wants so he has walked. As far as he knows, the series will continue, but it will be without him. The outcry on social media was both predictable and astounding. As soon as Kimmy Robertson (who played Lucy on the original series) posted her cryptic but not-so-cryptic posts on Facebook, fans took to their various venues and declared their outrage. Twin Peaks became the second-ranked trending item on Twitter, after "Happy Easter" and Showtime's Facebook page was deluged with hate. Here's what I think: this is not a bluff (Lynch really is planning to walk if/because he didn't get what he wanted) but Showtime will bend over backwards to get him back. Their response suggests that they didn't see this coming, and that he has essentially pulled a fast one on them. In negotiations, ironclad principle will always defeat business considerations. The latter is subject to reconsideration, the first is not. 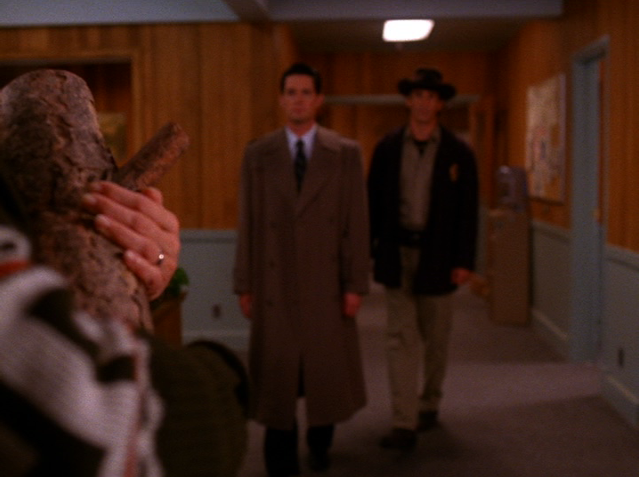 Perhaps I'm naive, but I believe Lynch will be directing all nine episode of Twin Peaks. I think this is where he needs to be, the defiant artist bucking the system, and that this is about that as much as anything.